A software developer may need alert notifications for both front-end and back-end performance, where operations personnel may need them for poor back-end performance, such as server memory or CPU performance. Rules to address alerting requirements and personnel that is responsible for them. Criteria that triggers alerts for monitored resources and apps in your IT architecture. Thresholds you define for different alerting situations when your selected metrics reach certain severity levels. Notification channels through which your team will be notified about the incident. Threshold alerts are the classic threshold based alerts. They are triggeed when something crosses a pre-defiend threshold. Anomaly alerts are based on statistical anomaly detection. They are triggeed when values suddenly change and deviate from the continously computed baseline. 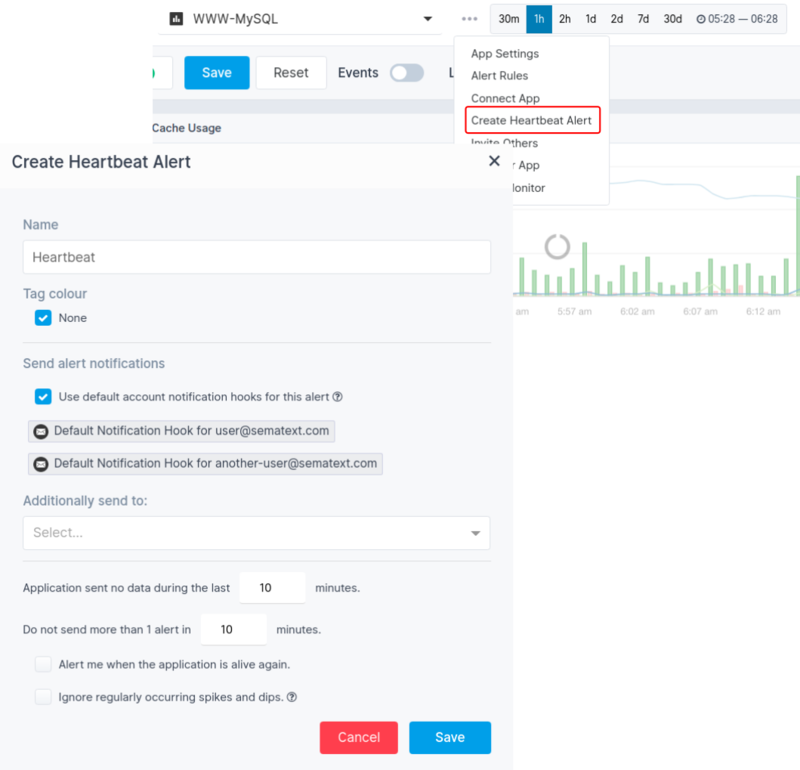 Heartbeat alerts are triggered when something you are monitoring, like your servers, containers, or your applications stop emitting data to Sematext. 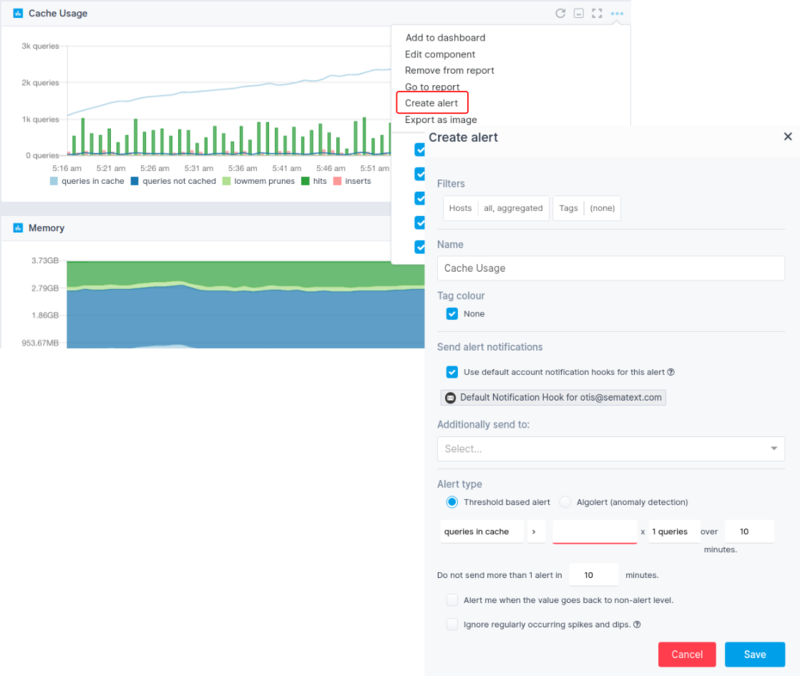 Threshold and anomaly alerts can be triggered for both metrics and logging apps, where heartbeat alerts are only available for metrics apps. Our alerting tools provide flexible centralized notification system that lets you manage alert rules across your whole stack. Focus on your key IT performance metrics and use various notification channels to get alerted when critical violations occur so you can take action and resolve an issue. Our alerting tools easily integrate with team communication software like PagerDuty, OpsGenie, HipChat, Slack, and more. Check integrations pages for more information. 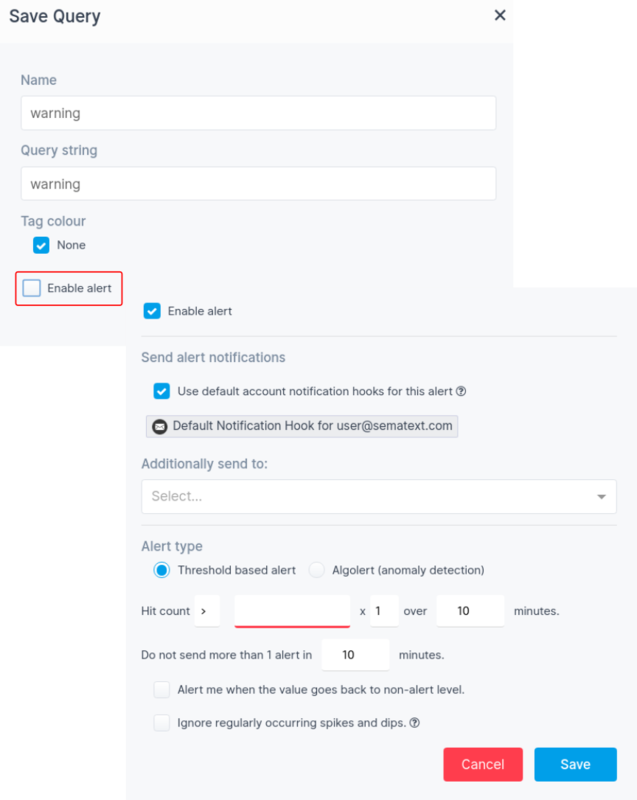 Understanding these fundamental alerting principles will help you get started with our SaaS or on-premises service and define conditions or identify what triggers an alert for the selected rule. You can easily configure alert rules and criteria required to create an incident record, manage notifications channels, and review alert incidents and assign responsibilities for the details of a particular incident. Alerting gives you the ability to create monitors that trigger notifications when performance problems occur in your IT infrastructure. As soon as any app is created, either logging or monitoring, the system will generate several app specific alerts rules to get you started. In the case of an example Elasticsearch monitoring app, Java usage threshold and Elasticsearch nodes anomalies were integration specific system generated alerts. There is also a heartbeat alert created that is triggered when the agent you installed stops emitting data to Sematext Cloud. Navigate to Alert Rules where you will find all system generated as well user generated alerts listed for all apps that were created. Use actions dropdown menu to edit or delete an existing alerts and icons are used to visualize different alert types. 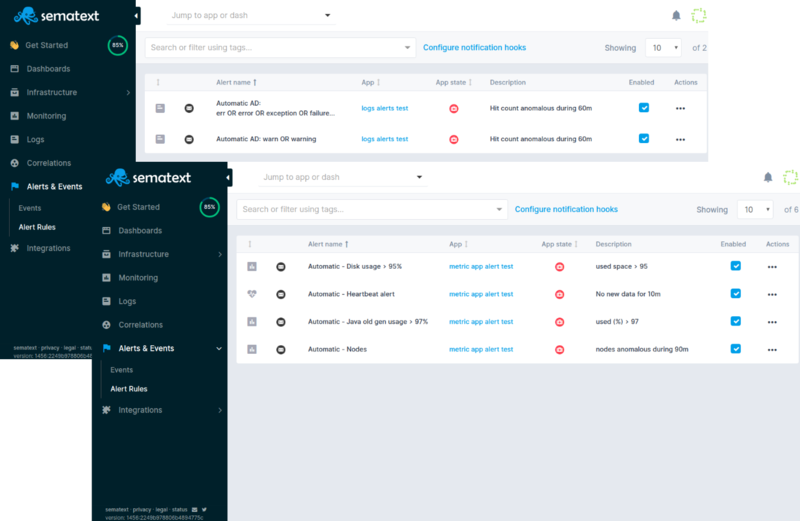 Sematext APM and logging management platform can accommodate IT systems requiring extensive alerting structure, but you may not need an extensive alerting structure at all. A simple alert policy with an email notification channel to cover basic alerting scenarios can be defined just as you can define complex ones. alert type, with threshold based alert and algolert or anomaly detection alert for any logging app. For more information on alerting capabilities check alerts documentation pages. Metrics monitoring has different alerting design than the logs query centered one. Although both have threshold and anomaly alerts available, monitoring apps use component based alerting userflow. Every metric time series becomes a component and custom alerts can be created for each, just as it can be added to a custom dashboard. Additionally, monitoring apps have Heartbeat alerts available as a part of app settings and available in the app settings dropdown menu. They are triggered when something you are monitoring, like your servers, containers, or your applications stop emitting data to Sematext Cloud. There is another important concept and system feature that we want to address together with Alerts. So what are events, why and how? Our APM and logging tools let you visualize not only performance and custom metrics or logs, but also events. Such events may represent what is happening with a server or cluster, with an application, etc. Think application or server restarts, builds, deployments, alerts, etc. 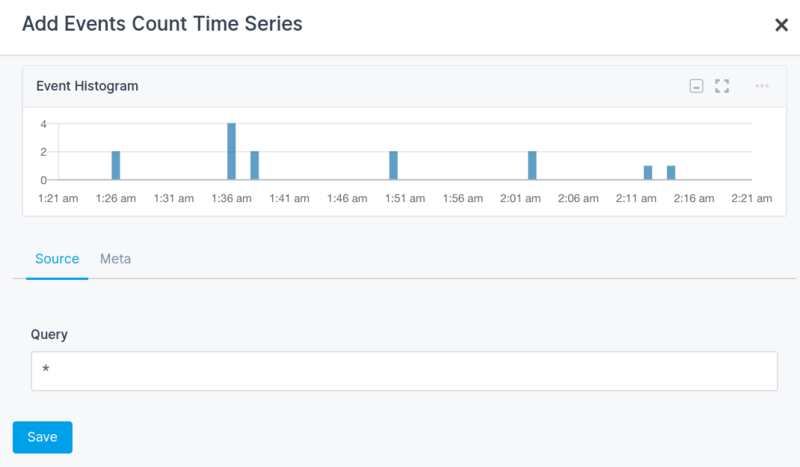 Events are graphed in timeseries charts and these charts can be shown next to metrics or logs charts. Image below shows the events correlation panel expanded within Apache monitoring app server metrics overview. It demonstrates Sematext Cloud events correlation capabilities with monitoring integrations. They can be also combined with server logs for a single pane of glass and full IT systems observability. This makes it possible to easily correlate events with metrics and/or logs. In addition to showing events as timeseries charts, a detailed listing of events can be seen and, of course, events can have tags, and can be searched and filtered. There are two main components that make up events. Both can be added to dashboard(s) just as metrics and logs components. Moreover, with ability to add new events and attach them to any particular monitoring or logs app as well as dashboards, it is a perfect tool to document and leave notes alongside machine generated data. It supports markdown format and provides a perfect way to provide human input later used for presentations and reminders. Events Histogram provides visual insight into events timeseries and can be easily filtered using time picker component shortcuts as well as zoom and shift chart tools. On the other hand, Event Stream table component provides a list view of all events that happened across your IT infrastructure. Whether monitoring or logging alert in Apache or Cassandra app was triggered, event stream view centralizes all of them in a single table. It is unified way to filter and pinpoint issues across multiple IT system administration dimensions. Beyond events that you want to see as part of your operations intelligence think about events that matter to your team or your organization in general. Such "business events" can be shipped to Sematext, too. Besides being shown in the UI events are also exposed via a REST API that lets you post, retrieve, and search your events. This REST API matches the Elasticsearch API, so you can use any Elasticsearch tool or client to post, get, and search events. Register for free or Login into Sematext IT systems monitoring platform to get started and create your logs app. Upload your logs from all your servers to our centralized log management solution with Elasticsearch API and integrated Kibana, and experience the first true Hosted ELK Stack.